January has been a long long month, for the first half I was averaging 2-3 hours of sleep per night so my days dragged on. This is because of the steroid dexamethasone, which I’m taking to reduce the inflammation in my brain. This blog is basically one long moan, about the drug which saved my life. Steroids have a lot of side effects particularly at the dose I was on, initially started on 16mg in total per day intravenously (into the vein). For the health care professionals who read this blog that’s equivalent to just over 100mg of prednisolone. It was a war in my own mind to work out what symptom was caused by what, either the cancer, sleep deprivation or the steroids themselves. I was being extra cautious as not to end up in hospital again; so I didn’t take any anti-sickness tablets, anything stronger for pain relief other than ibuprofen and I bought a blood pressure cuff as before my BP went up and my heart rate went down (Cushing’s Reflex). The side effects are all encompassing, both mental and physical symptoms. I’ve been properly hypomanic a couple of times. That means mania but still functioning, think of a person with bipolar. I definitely had pressure of speech (where you literally speak your mind), flight of ideas (ideas racing through your head, not really focussing on one particular thought before moving on). It was exhausting and occasionally I just felt irritable. Along with that though had some short episodes where I was quite low, I even had some intrusive thoughts of walking in front of a tube train, a very scary experience and I just cowered onto a bench until the train came. All the mood changes were short lived unlike bipolar. But worst of all was the lack of sleep. The steroids were compounded by the fact I am a bit of an insomniac anyway, because I have cancer and I’ve never been able to lie in. The reason for the poor sleep and the mood elation is that dexamethasone mimics cortisol (the stress hormone). Cortisol is the hormone which literally gets you up in the morning, and it’s levels are low at night. But if you’re taking it and a lot of it, then it makes sense that you cannot sleep, furthermore it pushes your mood up. Your brain ends up in constant on mode. Put it this way one of Georgie’s patients recently became psychotic just on 30mg of prednisolone only third of what I was taking at the beginning. Sleep became an obsession. The first Sunday out of hospital I rang up and got a prescription for temazepam (like Valium) to help me sleep. Afterwards, Georgie and I went to the massage place I had a voucher for from Georgie’s Brother and Sister-in-law. I took two zopiclone, a sleeping tablet, and two temazepam throughout the night. I slept 6 hours! I was so relieved. Thinking I’d cracked the nut. I had tried everything before that. I was a bit against taking Zopiclone prior to this because previously it’s given me a bit of a hangover effect. However the steroids wired me up so much, like 6 cups of coffee, this was not a problem. It reminds me of my easiest diagnosis as a doctor. Where a older lady was drowsy and the son was looking bemused as to why the carer had called an ambulance. She had taken her midnight medications, including Zopiclone, by mistake morning instead. Diagnosis: asleep. However alas, the 6 hours sleep was a one off for most of the next week. Back when I was more well, I have had a few shifts at work where I’ve not slept beforehand. Sleep has now improved as the dose has been weaned down. Just to pass the time I ended up doing quite weird things in the middle of the night like unsubscribing from all my junk emails or downloading the Mandela film, at that point I just had to watch it, fortunately it was good and I’d highly recommend it. Apart from that some programmes Georgie and I starting watching for example, Making a Murderer, but this added to my poor sleep, due to making me think a lot. We then stuck to watching Gavin and Stacey which we’ve watched before and Don’t Tell the Bride. Both very uncontroversial. Gavin and Stacey albeit old, it’s brilliant and we can watch it over and over again and still laugh. Memorable moments this month include going to watch “The Curious Incident of the Dog in the Nighttime” a play made from the book. The main character has Asperger’s syndrome (high functioning autism) and ends up making a journey to London, for reasons I will not spoil, the set was actually the best part. A light show with lots of noises all around this was to try and emulate how hypersensitive people with his condition are. But so was I. While watching it constantly stroking at my beard and getting lost in the set. I was hypersensitive too. At one point he steps onto the tracks at an underground station, to try and catch his pet rat, I was frantic my heart rate going faster, I do not usually respond quite as dramatically. But right then I thought what was happening was much more real. Dave, Rhys and I went to Alexandra Palace to watch the snooker, I was so high on the steroids that everything was in Ultra HD. The balls of the snooker table were elegantly poised swimming on the surface of the green. We chose a particularly good match to see Trump Vs Robertson, (kind of depends on your opinion on watching snooker!) both players were on fire and the game ended 6-5 with six centuries throughout the frames. The whole day felt like ‘the curious incident of the dog in the night time’ as it felt that I the jolly cancer patient was doing so well. As it was the furthest away from the comfort of the Royal Marsden that I’d been on public transport. Next is the profound difference these drugs have made on my body. I realised early on how weak I had got from the short stay in hospital and the very high dose of steroids. Most people think of anabolic (build muscle) steroids which people abuse in the gym. Dexamethasone is catabolic (destroy muscle) and cause muscle wasting particularly of the quadriceps (thigh) and upper arm muscles. Georgie even said “but your thighs are your best bit”. 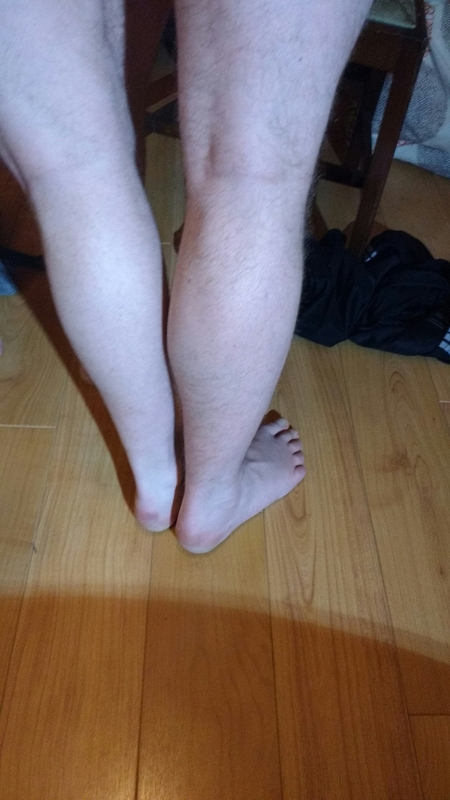 The picture attached shows the calves of both Dave and me for comparison, (useful to have a twin brother). I decided a thigh photo was a bit risqué. It’s slightly misleading because his calves were a little bigger than mine beforehand, but the difference is most certainly more marked now. The worst moment was just out of Royal Marsden Sutton Hospital where I needed to bump start my brother Matt’s car. We had to get my potassium checked as the result the day before when I was an inpatient came back as low. Please see the video of me drinking SandoK YouTube . A potassium replacement drink that tastes like drinking seawater. I was pretty much useless at helping Matt either using the steering wheel which lacked power steering, as the car was not on, as well as well as pushing the car. Considering I used to be able to press the whole stack of weights on the leg press machine on the gym, steroids had taken their toll. Matt albeit athletic, is much more Mo Farah than Usain Bolt and was not too helpful either. Fortunately some guys came and helped us out, only for Matt to drive up the hill too fast for me to catch him. Right then I could only run ten metres, so much for half marathons. I’ve also lost height. Along with all that, my neck is larger and I’ve now got a small buffalo hump on the back of my neck. Most annoyingly is my back, I have mild curvature of my spine, as Dave crushed me in the womb, something which gave me pain for years until I started working on my back in the gym. After that it became a thing of the past. With the muscle wasting it’s come back with a vengeance. Then there’s the head, I have to keep wondering what is causing any headache, as dexamethasone causes eye pain, headaches and even pounding in the ears. Sounds all a bit like having brain cancer or raised pressure in the head. Knowing this actually helped me wean the steroids down. As I’ve said, I’ve been very tentative with taking painkillers too, absolutely no opiates (morphine/codeine) and sparingly taking ibuprofen. Testing what was cause and effect. Edging the steroids down and seeing what happens. Hoping that I didn’t vomit, lose the ability to write, or speak. There was a moment later on in January where I was napping whilst in Georgie’s student hospital accommodation, and she needed to get in as I had the keys. A mixture of poor signal, she was using Whatsapp call, and me just waking up made her think I was having a repeat of the previous pre New Year episode as I was making very little sense. Lastly, there’s the issue of long term side effects, thin skin, increased risk of diabetes and osteoporosis. Regarding the first there is very little I can do apart from continuing the wean. Perhaps it is not helped by the humongous appetite steroids gave me especially on the higher doses. One day I had 8 weetabix, two bananas, 5 cookies, a sandwich, toast and a calzone. To combat Osteoporosis I enquired about taking bone protection (bisphosphonates) but lacked evidence plus I’m in a very low risk group for getting it. As I’m a male who did a lot of exercise particularly hiking as a child/teenager. But to feel I’m doing something I’m taking over 50’s Osteocare which is full of calcium and vitamin D.
My fear with this blog is it sounding negative. What I will say is the steroids brought me back to life and I’m grateful, but even more pleased that I’m on a lower dose now for my sanity and my sleep! Thanks Sue I’m not usually suicidal, it was a side effect of the steroids.